An all-time diner favorite, this mile-high club is our last sandwich this week, with a HG twist. This triple decker tower of ingredients layered with artisan bread is truly a showstopper. Reclaim dinner this week, with this rich and satisfying robust sandwich. Who says you can’t serve sandwiches for dinner? Don’t just think of sandwiches for livening up lunch. With school in full swing, and everyone’s hectic schedules this fall, we decided to make Heather’s go-to weeknight staple, her take of the roast beef club. The clubhouse or also known as the Dagwood is on the rise, here at MDF. 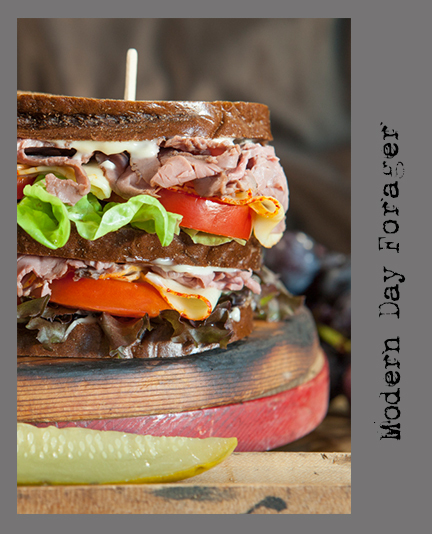 Heather built this decadent meaty sandwich with style, care and flair. First and foremost, you should know that Heather goes to great lengths to curate high-end carefully sourced ingredients, so with that in mind, she started with rich toasted dark rye and it grew from there, slathering our version of Kewpie mayo with the addition of fresh grated horseradish and chopped woodsy rosemary. Then added fresh crisp greens, juicy ripe plum tomatoes, smooth but slightly tangy Muenster (cow’s milk cheese with a thick orange rind) and mounds of slow roasted, thinly sliced, rosy pink roast beef. Highly anticipated for this combination of flavors and textures, this beauty was a huge hit in our test kitchen as Heather crafted her three-story stack of goodness for our photo shoot. At the end of the day, the result was a hearty dinner which was ready in no time, and boy was that a good thing, because boy were we hungry. Tooth picks – you will need them! 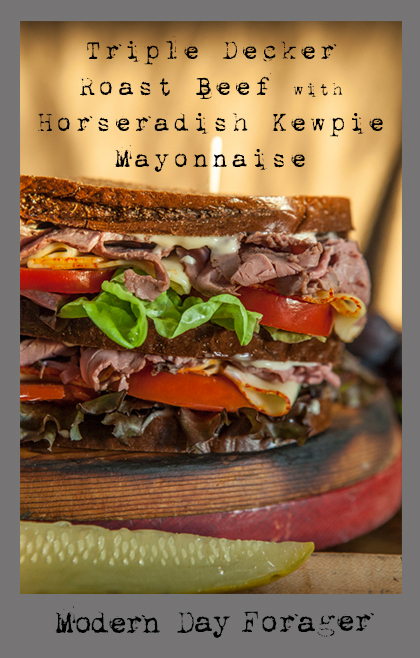 Toast the bread and spread horseradish Kewpie mayonnaise on 3 sides. Build the sandwiches–first with a layer of lettuce, then tomato, then cheese, then roast beef. Top with another layer of bread and add to that lettuce, then tomato, then cheese, then roast beef and the last piece of bread. Add toothpicks to help hold together. Find someone to share this with, it’s a big sandwich! Whisk Kewpie mayo, horseradish and rosemary in small bowl and season with salt and pepper.